The First Legion is a 1951 American drama film directed by Douglas Sirk and written by Emmet Lavery. The film stars Charles Boyer, William Demarest, Lyle Bettger, Walter Hampden, Barbara Rush, Wesley Addy, H. B. Warner and Leo G. Carroll. The film was released on April 27, 1951, by United Artists. Fr. John Fulton, a Jesuit instructor in a seminary school, feels he has lost his vocation. A talk with his friend Fr. Marc Arnoux is no help. 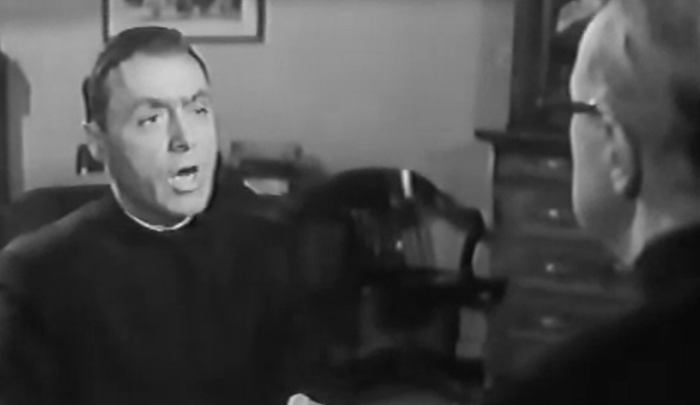 But on the night he plans to leave the seminary (and the Order) his old teacher Fr. Jose Sierra miraculously gets up and walks, to tell him to stay. The young, wheelchair-bound neighbor Terry Gilmartin regains hope a similar miracle might allow her to walk; her physician, Dr. Peter Morrell, the same one who attended Fr. Sierra, and who is in love with Terry, confesses that he had engineered Sierra’s miraculous recovery, to Fr. Arnoux, but refuses his advice to tell the truth. The Jesuit seminary rector orders Fr. Arnoux to plead the validity of the miracle before the Vatican, in Rome. When his highly respected subordinate refuses, the rector dies of a heart attack. At that point Dr. Morrell admits his deception, in particular to Terry, who goes to the seminary chapel and, miraculously, gets out of her wheelchair, at the moment she prays for Dr. Morrell.